It’s hard to explain the feeling of being all alone in a strange country surrounded by foreign faces, sounds and ideas. While surrounded by the the uncommon you soon realize that it’s not your surroundings that are strange, but yourself. The eyes of curious locals can’t be hidden, and they are shouting out at you letting you know that you are different. I had become very comfortable in the Spanish speaking parts of South America. I spoke the language. I understand how things work. And most of all, I had come to fit in. But as I found myself stringing up my bright red hammock in the midst of dozens of others on a wooden boat in the middle of the Amazon, the realization of strange came rushing back to me like the first time I set foot on foreign soil. And I’ll be honest, I kind of liked it. As I board the poorly painted boat that was to take me across the mouth of the great Amazon Basin, giggles and confused questions about where I am from and why I am on the boat fill the air of choppy conversations. 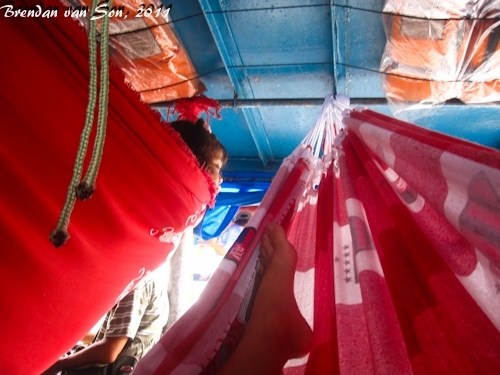 I carefully squeeze my hammock to what has appeared to be the last spot on the top deck of the packed river boat hoping to not disrupt those already attached. To my amusement, however, just as the sardine tin deck appears to be full, local passengers manage to squeeze a half dozen more hammocks if not beside then above the others. I soon come to the realization that privacy was not at a premium, and that unintended cuddling from nearby sleepers would be impossible to be avoided. As I lay back into the comfort of my adult sized cradle and open my notepad to begin writing I can’t help but be consumed by one of those moments we have in travel where we just shake our heads and laugh. It is these moments of realization that make travel so powerful. I am slung in the midst of a couple dozen Brazilians at the mouth of the world’s largest river. My pen wanders through the page writing of the rich green scenery that passes by in the distance, it dabbles words describing the chocolate coloured milk river water that seems too peaceful to be flowing. But as the curious eyes of children peaking out from their hammock playgrounds stare shyly at me it is that sensation of being different that keeps coming to the foreground of my thoughts. I often wonder if this is the real reason that we travel. Is being different something we seek out without fully knowing it? Is it possible that we feel more important when we are on the road than at home? On a greyhound crossing the prairies of Alberta I am just another guy with a bad haircut, but on a boat in the Amazon Basin I am the focal point of curiosity. Over the past couple of months I have been searching for answers to why I do what I do. In the end, I really hope that I don’t travel in order to satisfy my own self-satisfying egosim. But in the end, maybe I do, at least a little bit. I wander to the boats steel railing to look out at the tiny communities of indigenous people. Children paddle out in dugout canoes and wave to the boats in hopes that someone aboard will toss them out a plastic bag filled with some food, clothing or toys. In this moment I can see the same thoughts going through the minds of many Brazilians on board as have been going through mine. Although they have only traveled from the main land their voyage is no different then mine. I can tell by the smiles on their faces as children shout out at them that they like being looked upon as different as well. Travel has a very funny way of making one feel special. As the dark Amazon sky provides me with the comfort of a bright nightlight in the form of a full moon, my mind sways with the roll of the gentle flow of the river’s current. I like being different, I like that people look at me in curiosity and I like that, yes, being a foreigner in a strange land makes me a little bit special. But that’s not the reason I travel. I travel because I like the person I am when I travel. When I travel I am a person that is independent. I am a person that isn’t afraid to step outside his comfort zone. I am a person that cares about the local issues. And most of all I am a person who continually grows and learns. I know that for the moment it may seem as though I am traveling for selfish reasons, but deep in my heart I know that someday I will be able to use all that I have learned while traveling to truly make a difference as a positive member of the global community. I travel because I know that it will someday allow me to become more than a simple pylon in the flow of the world, but rather an active participant with a voice that is heard and respected. Those who follow me know that my articles are actually two months or so behind where I actually am. I am currently in Medellin, Colombia. I had been running articles chronologically recently, but that will change. I will still be running articles chronologically in this manner, but while also throwing in some other stories as well, including ones from here in Medellin. On Wednesday, however, I will be reliving one of the times I actually worried my life was in danger, the time I was shot at in Managua, Nicaragua. Choosing to be a “citizen” rather than a “consumer” is an honorable goal, Brendan. I really enjoyed your article. Keep safe. I really enjoyed this post BV3K ;). Dalene and I have discussed this very same thing about the not fitting in, and the attention that it draws. I suppose it is a small sense of self-satisfying egoism, but for me I feel more in a sense of community or family with these complete strangers, than I do if I was riding that same greyhound bus back in Alberta. It’s strange that I will strike up a conversation on a bus anywhere in Latin America with anyone who sits next to me and wants to be talk politics, weather or whatever, but I usually would not do this back home. I agree with you, that I travel to step outside that comfort zone and experience what the world has to offer, always learning new things. You are already a positive member of the global community through your blog. You have that voice that is heard and respected. A really great article. I think that you are right in the sense that we all seek out to be a little bit different and a bit special when we travel. It kind of adds to the thrill and excitement of it all. But like you said, I also feel that we can use ‘being different’ in a positive way. we can help others, use the skills we have from our own country and put them to a positive use. Your adventure on the boat sounds pretty special, how long were you on there for? 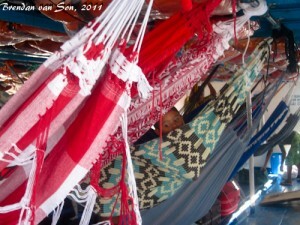 I get terribly sea sick, so not sure if i would have been able to handle it-plus being on a hammock! Thanks Elise! I was just on the boat for 24hours although there are boats in the Amazon for as many as 10 days. To be honest because it’s a river and a calm one at that there is very very little rock the boat. You’d be fine for sure! I had this same feeling in Asia one time. I looked out my window and everyone was Asian. It was an obvious realization, but one that felt really awesome at the time. btw: I was on a very similar boat for 5 days, from Manaus to Puerto Velho. 200 strangers, 1 very unhygienic cook and two toilets led us to get to know one another rather rapidly. Hey Steve, yeah, I almost did that trip but I was kind of in a hurry to get up the the Guyanas. I had a great time though. Good experience.